This little history blog tends to skip around a lot through time. From week to week, I am as likely to share a story from the middle of the 20th century as I am to relate a tale of ancient man. And still, you the readers are kind enough to follow me down the rabbit hole. So this week, I am hoping you’ll allow me to push the already very wide historical boundaries I have informally set for myself. I’m going to hop into the way back and arrive many many years ago, at the height of 1980s America. Specifically, I’m turning my attention to October 9, 1987. I had recently turned ten and the greatest movie I would ever see was released into theaters. But I didn’t see it. In fact, like most people, I didn’t see it for another year or two, when my older brother brought it home from the video store one day. Even though The Princess Bride has since been included in the list of 100 Greatest Love Stories by the American Film Institute, the list of 100 Funniest Movies by Bravo, and the list of top 100 screenplays ever produced by The Writers Guild of America, it initially fell kind of flat. Even after 27 years, we’re all suckers for a good story well told. On the off chance that you’ve not seen the film (and if you haven’t, you really should), I’ll quickly set the scene. In the course of mounting a rescue, the hero Westley has been murdered by the prince who wishes to wed Westley’s true love. The body is recovered by two of his enemies-turned-friends who are seeking his help in exacting revenge against one of the prince’s evil agents for another past murder. 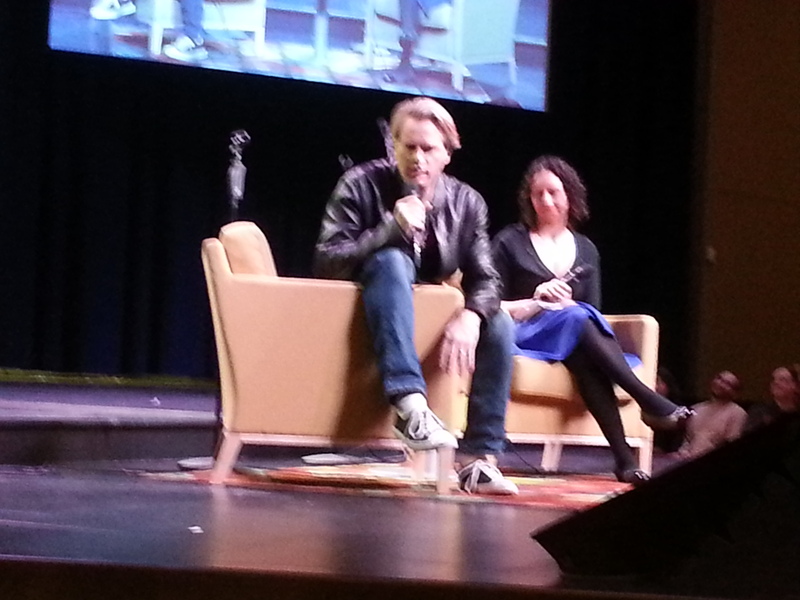 Elwes has referred to this project as a love letter to the fans of the movie. And it really does have a lot of heart. The two men take Westley’s body to Miracle Max, played brilliantly by Billy Crystal, made up to look approximately 900 years old, and in one of the funniest movie scenes ever, Max, with the assistance of his wife Valerie (played equally brilliantly by Carol Kane), decides to make a miracle pill, coated in chocolate, to revive Westley. The hero unsurprisingly turns out to be a quick healer and has little trouble then defeating the prince and saving the girl. I’ve written about this film once before, in a more historical context. A couple years ago much of the cast reunited at the New York Film Festival to celebrate the 25th anniversary of the release. It’s my all-time favorite movie, filled with quirky characters, witty dialogue, thrilling adventure, and just plain fun. So the 25th anniversary brought back to mind the experience of falling in love with it. Of course I couldn’t attend the celebration screening and Q & A, but I felt I had to write about it to express my love in a practical history sort of way. Elwes, a natural storyteller complete with spot-on impressions, gets comfortable with the large crowd of enthusiastic fans. It turns out my reaction was similar to that of Cary Elwes (Westley). After the Film Festival and flood of memories, he decided to write a memoir about the making of the film that was both his first big Hollywood break and the one that will in some ways forever define his career. 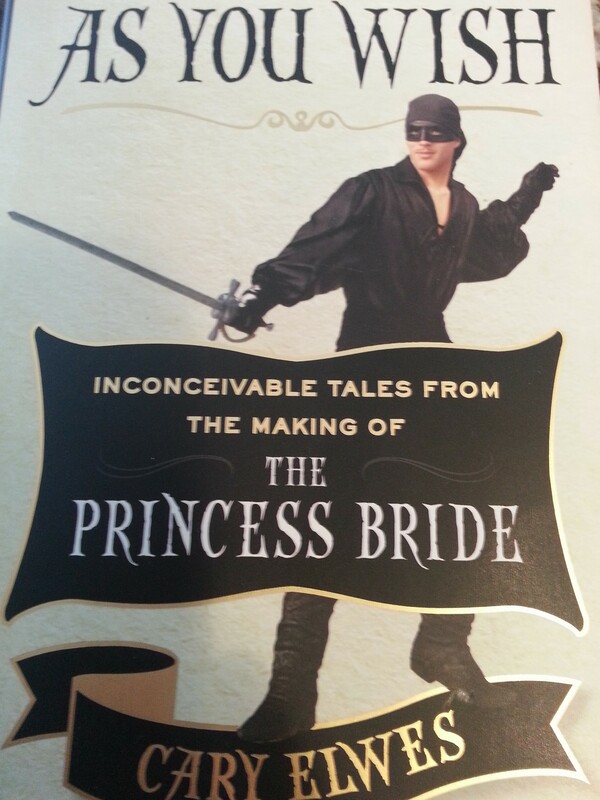 The result was As You Wish: Inconceivable Tales from the Making of The Princess Bride. If you’re a fan of the movie (and there’s a pretty good chance you are), you’ll find the book delightful. It will have you watching the film again, searching for hints of the behind-the-scenes stories. You’ll learn that Westley’s hurried skipping along the ravine floor leading into the fire swamp is the least awkward way Elwes could run after breaking the snot out of his toe not long before the take. You’ll discover what gave Elwes, Mandy Patinkin, and Andre the Giant such a terrible case of giggles on top of the castle wall. And you’ll find remembrances from many members of the talented cast and crew that brought to life the story and characters we have all come to love. Why yes, that is ticket number 1. It’s nice to know people who understand and accept your crazy. 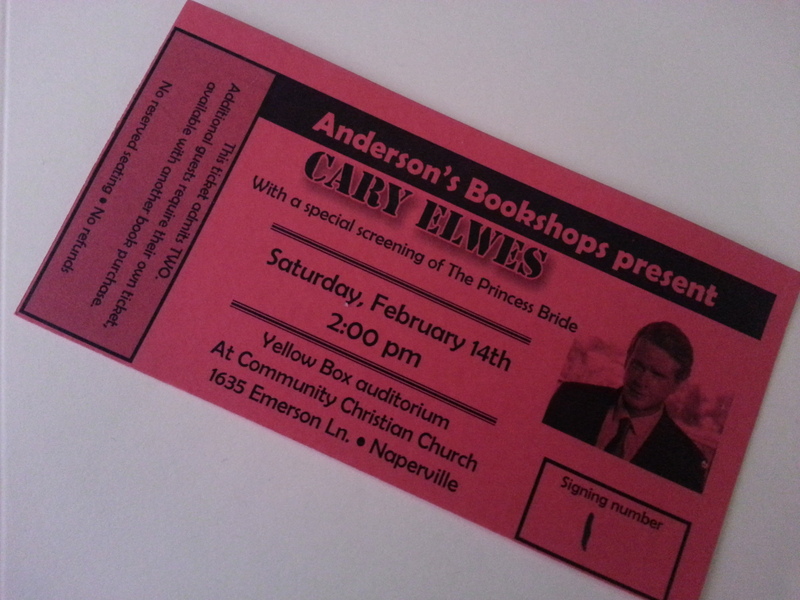 Now, two years ago it was inconceivable that I would go to New York to celebrate the film’s anniversary, but a month or so ago, my friend Michelle let me know that a friend of hers is an events coordinator for Anderson’s Bookshop, a large independent bookstore in Naperville, IL (southwest of Chicago), and that she had just booked Cary Elwes for a signing on Valentine’s Day. I told her I was in. With traffic, Naperville is probably a little over a five-hour drive from where I live near St. Louis. I met Michelle on the way for a crazy-fun, if slightly ridiculous road trip and I met the man in black himself, who, I have to say, seems a decent fellow. Of course the book has been out since October, long before the planned road trip and so I already owned a copy. 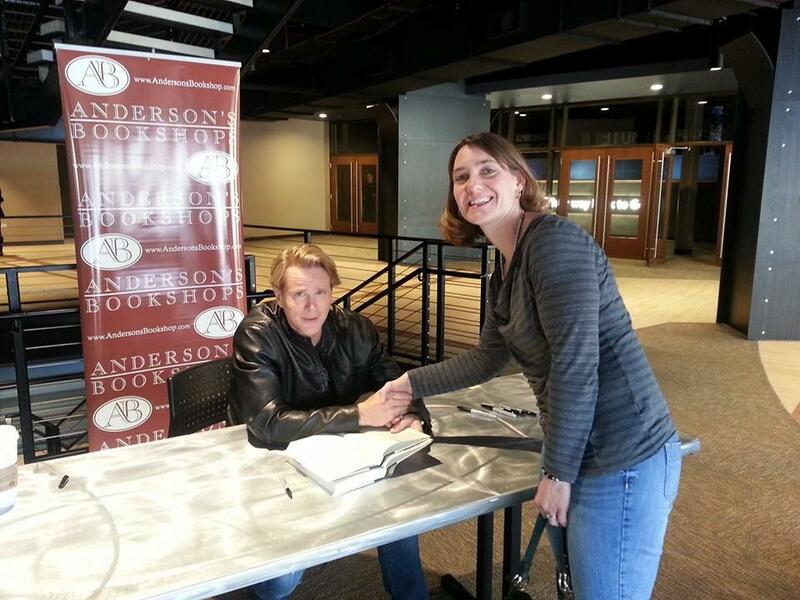 But with such a large name coming in, the bookstore had to make this a ticketed event, and, as is customary, the ticket was the price of a reserved book. That means I now have an extra copy of As You Wish: Inconceivable Tales from the Making of The Princess Bride, signed by the author. You can’t tell this from the picture, but 12-year-old me just fainted. So here’s what I’d like to do. I’d like to give it away to one of you. If you are a fan of the movie and think you would enjoy the book, simply like my author page on Facebook or follow me on Twitter (which you can do from the sidebar of this page) and share this post. If you’ve already connected with me on one of those platforms and would like a chance to win, just share and drop me a comment to let me know you want in. Make sure you enter by noon (12:00 pm, US Central Time) on Wednesday, February 25. I’ll announce the randomly selected winner on my regular Thursday blog post, which I promise will contain much (or slightly) more practical history, from way back in the years before 1987. 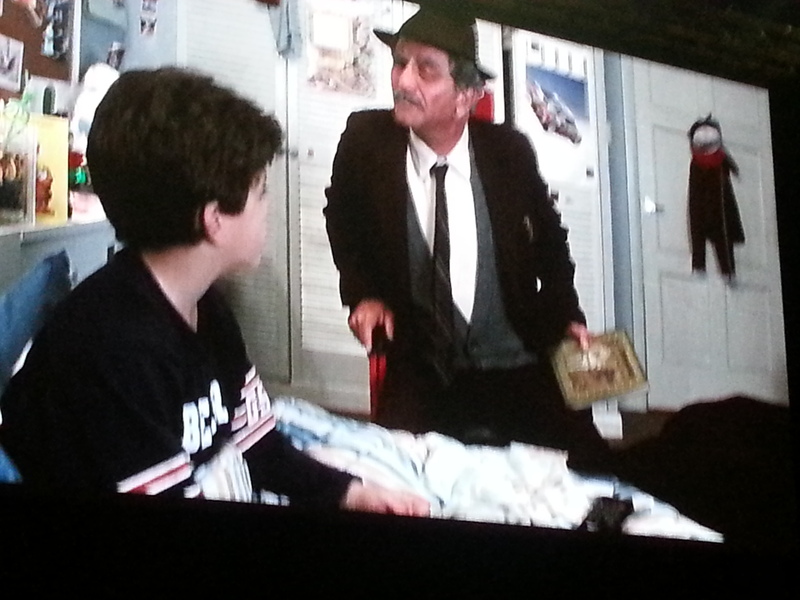 You had me at the first photo of Peter Falk and Fred Savage. Yes, we watched this movie again over the holidays. My husband loves this movie. I’m commenting to enter myself on behalf of my husband who would be thrilled to win such a keepsake. [I must say you give away your age and by my calculations you are as old as husband and I are married. You don’t have to be born in ’77 to like this movie or even married in that year.] I like your sense of adventure that hatched such a fun road trip that you and your friend cooked up. Again and again is the only way to watch this movie! I wore out two copies on VHS before getting a copy on DVD. And I am very grateful to both my friend who remembered how much I love it and to my husband who didn’t even laugh at me when I said I wanted to make the drive. True love really is the greatest thing in the world. What a wonderful story! And good for your husband! What else can you possibly say when confronted with such an opportunity? He sounds like a keeper! I like the Carol Kane and Billy Crystal magic potion scenes and the final repetitive scene. My kids loved this movie, which my Dad bought thinking it was a great, funny film and fairy tale! Somehow it never gets old. As he was talking to the audience, Elwes asked the crowd to forgive him if he messed up a line, given that it had been 27 years, and we probably knew the lines better than he did. Of course, he didn’t make a single mistake, but occasionally checked with the crowd just to be sure. A very charming man.